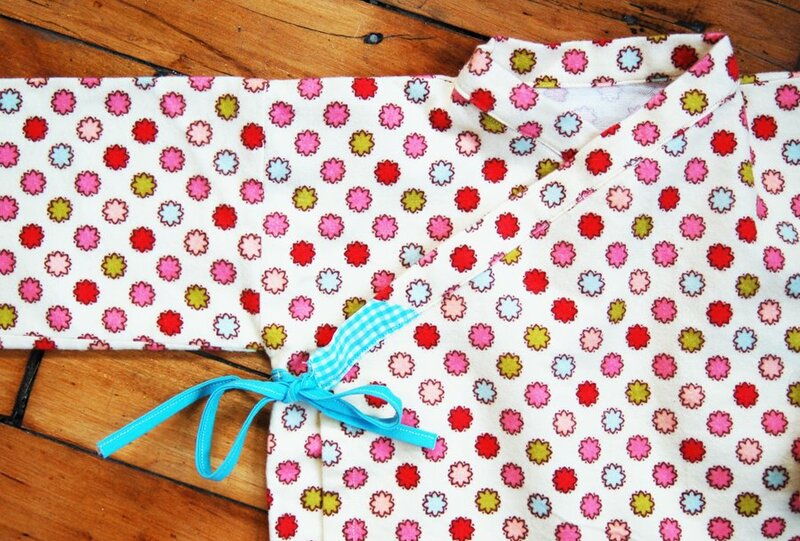 This sample kimono top recently returned from the pattern grader, and I was surprised at how much I like that little bit of contrast fabric that got added to the neckband now that I see it again. I had cut the band too short (it was an early test pattern and I think I eyeballed the neckband rather than create a pattern piece for it), so I grabbed the nearest available fabric to fix the problem. At first it looked wrong to me, but now I sort of like that fun little pop. 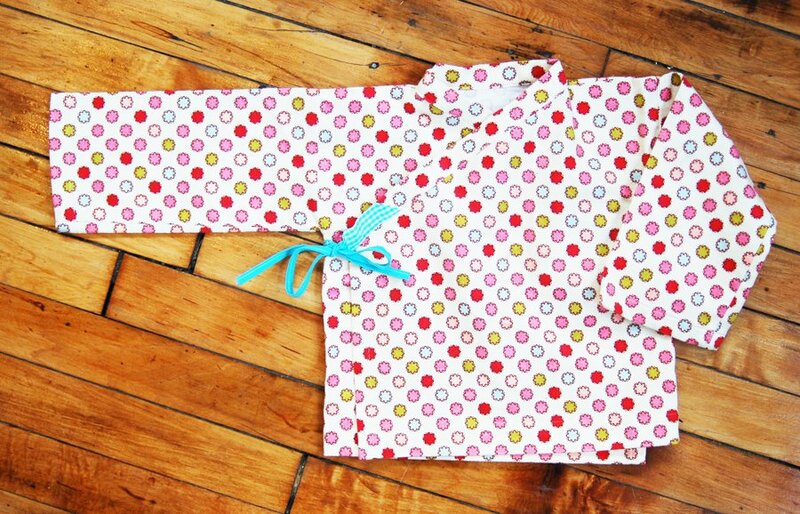 I may use this idea again the next time I sew the pajamas. The Bedtime Story pajamas are designed to be a beginning-level pattern for someone who may have sewn one or two projects before but hasn’t necessarily followed a pattern yet. They would be a good project for for a sewing class, too. She needs a new pair for winter. Flannel this time. With that little contrast at the neckband and tie, I think. I’m fairly new to reading your blog – but wanted to let you know I recently ordered this pattern! I have since finished four sets for my little ones and their cousin to be surprised with on Christmas Eve! I’ll be posting it in a couple of weeks including how much I loved your pattern! It took me a bit longer than an hour! But, I was able to do one set each day during nap time – so yes, still very quick. I used flannel and these turned out super cute – thanks for the great pattern! That is a very cute little touch. I still am needing to conquer my goal of making at least one of every pattern you design. I think these are about to be moved up to the top of the queue! Very cute, and I agree, such an easy put together look even for bedtime. Wonderful. I cannot wait to finish with all of my Christmas things, so I can start sewing for my children. Thank you for the wonderful pictures and patterns.